The TRUSU Equity Committee recently revealed that a student referendum will be hosted this fall to determine whether the university will adopt a student refugee program (SRP). Voting will take place between Nov. 21 and 23 so students will be able to cast their vote in favour or against the proposal to have student refugees on campus. The SRP is an initiative started under the World University Service of Canada (WUSC) which supports refugee students through providing the opportunity to study in Canada at the postsecondary level. “It gives them access to educational opportunities that they wouldn’t have in a refugee camp and it basically provides a safe space for them to learn,” said Sierra Rae, vice president equity. She added the committee believed the SRP would be an ideal way to “connect students with refugees worldwide” because it is a “unique opportunity” that is not available in other places. 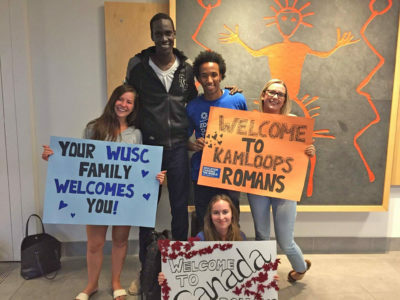 To date, TRU is one of the few Canadian universities that has yet to adopt the SRP, although TRU’s WUSC Club was able to sponsor one student refugee, Romans Manyiel Garang, in the last school year. If the majority of students vote in favour of adopting the SRP, one student refugee will be sponsored to enrol at TRU every year, starting next September. In the meantime, the Equity Committee said they plan to raise awareness around campus to inform students on the upcoming poll. The WUSC SRP is a “rigorous and competitive process” used to screen student refugee applicants through which only one-hundred and fifty are selected. To be considered a refugee, applicants must prove that they are being forced to flee their countries due to war, persecution or violence. “The global refugee crisis is an ongoing issue and people are fleeing violence and war and looking for safety and it’s often tough for regular people to make an impact on a big universal issue like this,” Rae said. Rae added she believes students and faculty should support the program because the experience can be mutually beneficial. She said while granting a student refugee the opportunity to pursue a Canadian education, students can also become informed “firsthand” about the refugee crisis and the global issues that create such environments.